Silence as an instrument of experience. An ongoing project to promote the qualities of silence and space in an urban context. Our project is about the experience and importance of urban silence and the connection between space and silence. 'Silence is an necessary angel' † TRES [1956-2016] Spanish silence artist. Not the physical definition of silence, or the acoustical definition counts. Through a phenomenological approach to silence the artists explore how sound unambiguously works on the human being (in this case in an urban context). Silence is an instrument of experience and as well as an instrument of knowledge. The project wants to realize a cultural bridge between the presence of silence as access to historical and natural soundscapes and the inner experience of silence. Silence is not limited to a material-accoustical aspect, silence is as well a part of city life as an inner space, a breating space. This project tries to involve young people in the making of and creating of (urban) silence. We invite students and young artists into the design process and try to engage them in the future development of their environment and to excite them about the city. Approaching silence will explore silence in the city, looking for design tools for the shaping of places and urban experiences. 'Open your mouth only if what you are going to say is more beautiful than silence' [Spanish proverb]. Silence is a topic within the Milena principle since the beginning and has lead already in May-June 2011 to a co-organisation with the Athens School of Fine Arts and the Goethe Institut Athens for a project, promoting the qualities of silence and space in an urban context, out of the experience and importance of urban silence and the connection between space and silence. Silence is an instrument of experience and as well as an instrument of knowledge, a presence in the consciousness, experienced with the senses and via the body. In this first project in Greece we were trying to involve young people in the making of and creating of (urban) silence, during the loud and intense political protests in Athens. In Edinburgh, five years later, our exploration of silence returns broadened to intimacy, sharing, gestures towards others and the environment, walking together. Most of the experts and artists, invited to Urban Emptiness, were not only related to the topic by their research or artistic interest, but collaborated before with eachother and are friends, even living in various continents-countries and some meeting for the first time physically. All friends, next to presenting their work, participated creatively within the actions of the others, intersecting and exploring the intimacy of it. The urban tea ritual ritualized the long friendship between Stefaan van Biesen and Geert Vermeire in slow, subtle and intimate gestures of dialogue and exchange, extending a time of togetherness to all the people present. They expressed as well a pleasure, an enjoying with the senses and with the body. Silence with a smile. In the history of visual art, the theme of silence has always been very present. There are countless examples of artists whose work is not only based on silence but whose works also exude silence. For example, the symbolist artist Fernand Knhopff [1858-1921], silence was an important theme in his paintings and sculptures. Even one of his works was titled: 'Silence' . Or just think of the silence the work of Mark Rothko radiate. A fundamental though is that silence may matter even more as a circumstance for the creation of art. So working with all aspects of silence is working in a long tradition. And as Gustav Mahler [1880-1911] once said: "Tradition is tending the flame, not worshiping the ashes.."
[Meander] Urban Emptiness Nicosia Festival Nicosia Cyprus 2017. [Meander] Silent performance Faneromeni Square Nicosia Cyprus during the Urban Emptiness Nicosia Festival 2017. A silent walk / performance, where concepts such as 'connecting / letting go / leading / trust / taking care of ' are the underlying ideas. In this constellation of influences, (of feeling and being involved), you become, as the co-walker, the work of art! Participants: Frans Van Lent, Ieke Trinks, Annemie Mestdagh, Deirdre Macleod, William Mackaness, Sophia Hadjipapa Gee, Marie Christine Katz, Abdo Alrezq. [Whisper] Urban Emptiness Nicosia Festival Nicosia Cyprus 2017. [Whispering] Urban Emptiness Nicosia Festival Nicosia Cyprus 2017. 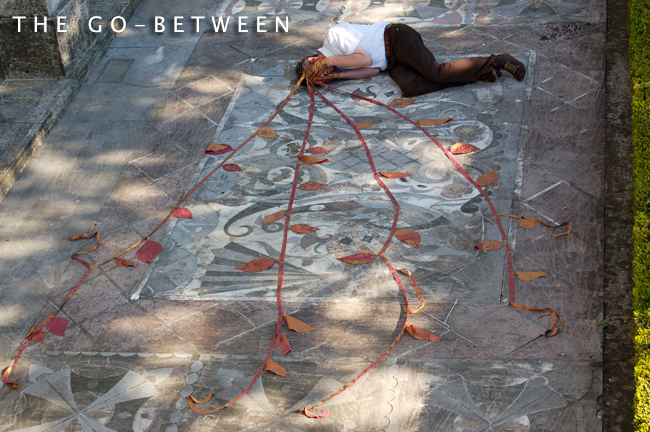 [Whisper] Silent performance with Geert Vermeire at the Paphos Gate [Green Line] Nicosia Cyprus. Urban Emptiness Nicosia Festival 2017. Camera & attribute: Annemie Mestdagh. Video, concept & soundscore: Stefaan van Biesen. Thursday 7th of December 2017. [The Sergiu Celebidache Variations] Silent performance/video Venice 2017. Concept Stefaan van Biesen. Musically speaking, one cannot change the music to make it more expressive. […] But the path of these criteria through the landscape, no matter how incompletely it is represented in the score, is a representation of the landscape. If we follow the composer´s guidelines, what is to be interpreted? […] Behind the term “interpretation” there surely lies the idea that one can treat music as it was a simple object, as something that can be taken out from the refrigerator, and topped with a certain sauce, depending on someone´s taste. There is nothing more false and more distant from what music really means. Sergiu Celibidache. Text by Geert Vermeire/student of Celibidache. [A Conversation Piece] a silent performance Venice Italy 2017. Geert Vermeire and Stefaan van Biesen. Camera by Annemie Mestdagh. Shown on the Urban Emptiness Nicosia Festival 2017. [Unfolding Memories] silent performance at Giudecca Venice 2017. Performance/video with Geert Vermeire in front of the house of our host Gabriella Pietropaoli at La Giudecca Venice 2017. This performance was a tribute to the laundry performance of ARTICACTS (CAN) by Pam Patterson and Leena Raudvee during the international meeting Made of Walking III at La Romieu France September 2017. The video was shown on the Urban Emptiness Nicosia Festival 2017. [Meander] Urban Emptiness ARBA/ESA Brussels Belgium 2017. [Meander] Silent performance students/artists in the frame of Urban Emptiness Network 16.11.2017 [walking as a research Lab at Arba-EsA] Académie Royale des Beaux-Arts de Buxelles Belgium 2017. A silent gesture. Concept & video by Stefaan van Biesen. Attribute performance Annemie Mestdagh. [Head Wanderer] Mindset for two globes. Mercatormuseum Sint-Niklaas Belgium 25.05.2017. [Mindset for 2 globes / Hythlodaeus] video/performance. Presentation of video/soundscape & performance for 'Opdonder' [an invitation by curator Johan De Vos and Eric Windey] in the space where two globes of Gerard Mercator [1512-1594] are shown in the Mercator Museum Sint-Niklaas Belgium 2017. This in relation to a lecture about 'the beauty of Mathematics and formulas' by Ronny van Meerssche. [Hythlodaeus sound track for the Utopia Sound Map: Cities and Memory ⋈ Oxford UK 2015. Composed, mixed and produced by Stefaan van Biesen/the Milena principle 2015. [Sensing Silence] EMST Athens Greece 24.05.2016. Sensing silence / the Diogenes variations: a silent performance by Geert Vermeire and Stefaan van Biesen - the Milena principle , with a complementary workshop about silence and the body in the empty EMST National Museum of Contemporary Art in Athens by Geert Vermeire (performance artist), Stefaan Van Biesen (visual artist), Christos Kakalis (architect) and Andromachi Vrakatseli (sound artist). Departing from the interconnection of sound and walking as a research method and artistic practice we explore the relation between movement, body and sound in the silent spaces of the empty museum, using recording technology, drawing and writing as tools to capture trajectories through silent space. In the frame of the Urban Emptiness Network - Edinburgh-Brussels-Athens 2016. The workshop was organized in collaboration with EMST National Museum of Contemporary Art and curator Ms. Anina Valkana as part of the Museum's educational programs continuing on the educational program "Young Sound Explorers» Co-organizer: EMST National Museum of Contemporary Art, Athens Partners: DEREE-The American College of Greece / Theatre Arts & Dance Department Athens School of Fine Arts National Technical University Athens / School of Architecture. An action by the Urban Emptiness Network - Edinburgh-Brussels-Athens 2016 / the Milena principle 2016. Camera & © video by Annemie Mestdagh and Stefaan van Biesen. 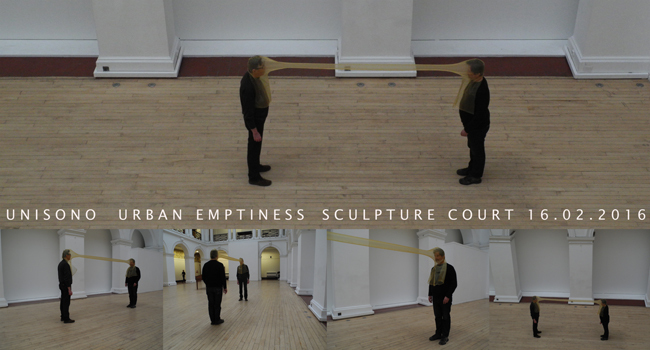 [Urban Emptiness] Fading Into Silence / Urban Tea Ritual ⋈ College of Arts Edinburgh. A video talk by Geert Vermeire and Stefaan van Biesen about the Silence project 'Urban Emptiness' Edinburgh 2016. 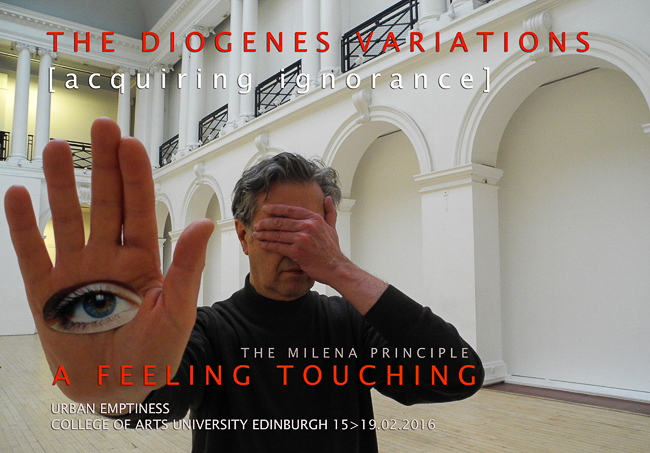 [Diogenes Variations] ( Acquiring Ignorance ) Silent Performance ⋈ Edinburgh Scotland. The Diogenes Variations: [ Acquiring ignorance / A feeling touching ]. As artists within the Urban Emptiness' launch week at the Edinburgh University we are observers, nomads in a noman's land of being and thinking. In the very first actions of the Milena principle in 2003 we departed already from a feeling thinking, a field between the feel and the vision, a decade later we (re)find the same territory, with a feeling touching in our movement through the (urban) space. Moving as well between Athens, Brussels and Edinburgh is reconnecting us with antiquity, renaissance and modernity. We become the Diogenes of our time, wanderers in the city with a lantern in broad daylight, looking for a human being, embracing ignorance. Diogenes saw himself as a cosmopolitan, a citizen of the world, not belonging to one place, open for encounters on the road and during his errands in the city of Athens. With walking and our bodies as tools we invite ourselves and the people around us "to get lost in the right direction", in a gesture of not knowing, opening our hands towards the environment around us, a silent listening. As nomads between cities as Athens, Brussels and Edinburgh we actualize, once more, travelling as a way of being, as a field of sharing. The Dürer connection; more then travelling continuously through Europe to work on location, renaissance artists and scholars travelled to meet their friends, leaving a trace of letters and ideas sprouting out of these personal encounters. It is this utopian field of sharing that thrives us through Europe, creating on and with the location and the people on our visible and invisible paths. Our travels are silent, our actions barely noticed, but they appear in a gesture of embracing what we find and let go, walking together with friends and strangers in a feeling touching, we are becoming the cities we pass by. The Diogenes Variations: [ Acquiring ignorance / A feeling touching ]. Unisono performance Sulpture Court ECA Main Building Edinburgh Scotland 2016. [Sea Born performance] Giudecca Venice 2015. Silent Performance with Geert Vermeire and Stefaan van Biesen. Camera by Annemie Mestdagh. On the occasion of 30 years since the death of Italian writer Italo Calvino (1923 - 1985), the department of Communication and Media of the University of Athens and the Italian Cultural Institute of Athens organize an interdisciplinary artistic and academic event called "Invisible Cities". "The Invisible Cities", the most famous novel of the Italian writer, was first published in 1972 and takes us to fictive towns, where wishes, exchanges, memory, signs and things emerge as building stones of an urban society, reflecting about the contemporary urban culture. The event brings together scientists, academics and artists in a personal and material dialogue about imagination and contemporary urban society. [Reading the moment] [Walking - Observing - Sensing - Being] Athens Greece 2015. Reading the moment is a collective walking experience through the street of Athens. No other intention, no other expectation than experiencing place/space allowing our bodies to archive our version of the city. Emerging from a spontaneous convergence of people, practices and ideas this initial exploration of Reading the moment is a collaboration among Geert Vermeire, Stefaan Van Biesen, and Marielys Burgos Meléndez. A walkshop in the frame of Episodes of Urban Emptiness: Real and Imaginary Explorations of Silence in the Contemporary City. Edinburgh, Brussels, Athens. Geert Vermeire is a Belgian curator, artist and writer, working between Athens, Lisbon and Brussels, referring to the concept of ‘the body as measure unit’ using the senses and the body as instruments of knowledge, experience and creativity, departing from social practices, community involvement and the ethical involvement of cultural action. Stefaan Van Biesen is a Belgian visual artist, multimedia artist, sound artist and writer. His oeuvre is focused on the research of walking as an instrument of knowledge and of artistic creation. Marielys Burgos Meléndez is an independent artist/researcher from San Juan, Puerto Rico. Her creative practice encompasses dance, performance art, movement and video installation, video art and creative writing. Through her current research, ISLA en FUGA, Marielys is dislocating herself, deepening in the experiences of mobility and survival strategies. 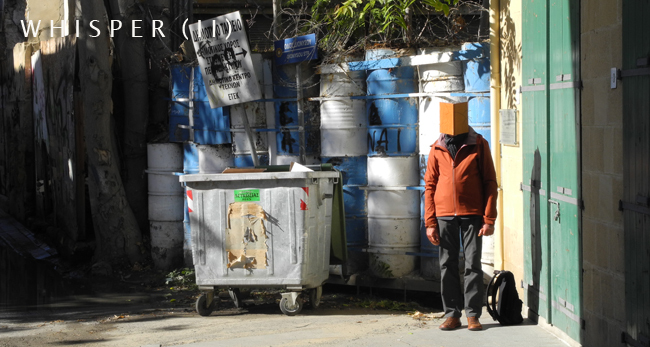 [Urban Oracle] ASFA Academy Of Fine Arts Athens Greece [Silence project] 2011. 'Urban Oracle' the Milena principle - Athens Greece 2011. Vaitsa Papazikou, Dimitra Siliali, Stefaan Van Biesen and Geert Vermeire speaking words in a tender gesture to the city of Athens. Visions and wishes appearing in the minds of four artists, connected in an utopian and human field of listening and silence. [Rain Songs] ASFA Academy Of Fine Arts Silence Project Athens Greece 2011. Rainsongs' the Milena principle - Athens Greece 2011. Listening and silence performance with Vaitsa Papazikou and Dimitra Siliali at the Acropolis in Athens. A curtain of rain around the young artists as a delicate sound in a city which came to a stand still after a thunder storm. Growing Silence] Silence Project at Goethe Institute Athens Greece 2011. A project to promote the qualities of silence and space in an urban context. Our project is about the experience and importance of urban silence and the connection between space and silence. In the Goethe-Institut Athens the Belgian artists Stefaan van Biesen and Geert Vermeire were showing videos of performances and art projects in Germany [the Naumburg Variations and Grunewald Variations ], next to an installation/performance made in Athens, documenting urban artistic interventions. [Liquid Islands] an urban silent ritual ⋈ Venice Italy 2011. A silent intervention, 'Liquid Islands' [washing the feet of strangers], in the old Renaissance city surrounded by sea. Myriam Bosschem [Belgium], accepted and asked several people, who passed by, if she could wash their feet as an urban gesture of caring and making connection. Starting in the early morning at Campo San Margherita, asking people to participate, finaly she found a traveling couple form Norway who accepted the offer: Jette KJ Øigard and her husband Bjarne Bjerkeland. The final location, where this unannounced event took place, was Campo San Zaccaria near San Marco, an old square where many people pass by. This urban ritual took place in the evening near an old waterfountain. People stopped and wondered. The Milena principle participated with Annemie Mestdagh, Ingrid Smeekens, Myriam Bosschem, Peter Maes [the colour U], Filip Van de Velde and Stefaan van Biesen. Camera Peter Maes, Annemie Mestdagh and Stefaan van Biesen. [The Go-Between] [How long is now?] Museu Nogueira da Silva [Minho university] Braga Portugal. During July 2010 the Milena principle stayed in Braga in Portugal in the Nogueira da Silva Museum. Installations were shown in the Biscainhos museum and also in da Silva. Stefaan van Biesen and Geert Vermeire did a silence performance. Lectures were held in the Serralves Foundation in Porto, Show me galery in Braga. A presentation of our new projects in MARCO, the museum of contemporary art in Vigo Spain. Meeting Stephanie Brandt of Spacepilots London UK and the soundartists of Escoitar.org Spain. Another silence performance by Julie Snauwaert/Stefaan van Biesen 'Sleeper' took place at the Noguiera Da Silva Museum in Braga. [Grunewald Variations] Silence Performance at Grunewald [Berlin Germany 2006]. [We carry our paths (I)] The Grunewald variations ⋈ Silence Performance. 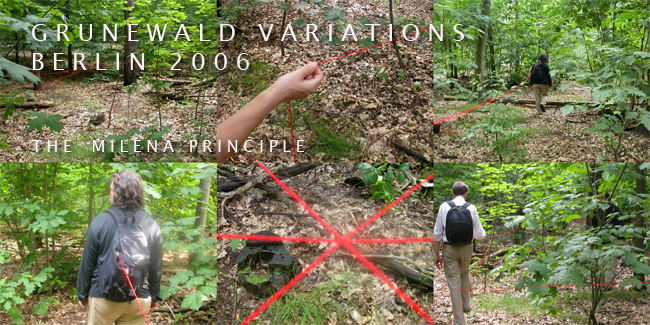 Videostils from the performance ' Die Grünewald Variationen'. A seemingly endless thread made visible the path of a walker in the Grunewald forest in the vicinity of Berlin. It was a silent tribute to the deportees who left for an unknown and terrible place. A greeting, a gesture of commitment. [Econcerto] Silence Performance [Natuurpunt] Willebroek Belgium 2006]. A 3 hour silent public performance by Geert Vermeire and Stefaan van Biesen during Econcerto 2006. This performance was by invitation of Natuurpunt, a Belgium ecological organisation that takes care for forres and landscape. 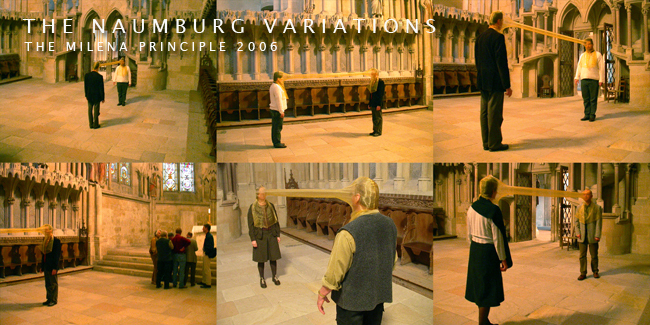 [Naumburg Variations] Silence Performance Dom of Naumburg Germany 2005. 'the Naumburg Variations' [Naumburg Germany September 2005]. 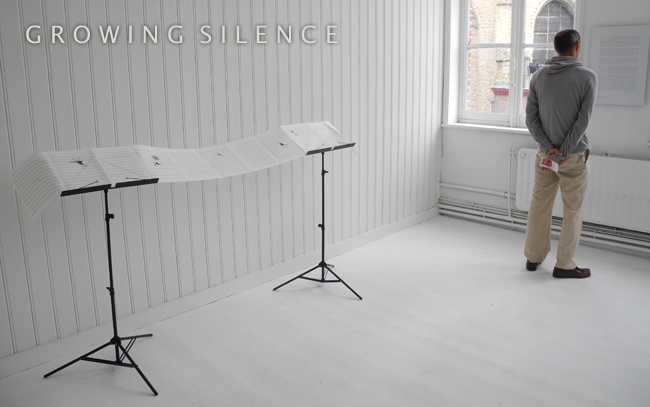 Silence performance by Geert Vermeire and Stefaan van Biesen held in the cathedral of Naumburg in Germany, along with participants of the Nietzsche Seminar. This part of the Friedrich Nietzsche Seminar [on the domain Wielandgut Osmansted Weimar 2005] with Professor Dr. Friedrich Voßkühler University of Darmstadt and Dr.. Frithjof Reinhardt, Weimar, at the invitation of Ingrid Pee [philosophical group Kassel]. Theme:'Auf den Spuren Friedrich Nietzsches von Röcken bis Weimar'. Eine Veranstaltung der Weimar-Jena Akademie in Zusammenarbeit mit Invitare vom 06.-09.10.05. “ Nietzsche als der Gekreuzigte. Leben und Werk als Überwindungsversuch des protestantischen Pfarrhauses“. [Sleeper I] About Melancholy Drongen Belgium & De Schrijnwerkerij CC De Werft Geel 2004. [Wereldstede - Sleeper (II)] Sleep performance by Julie Snauwaert during 'About melancholy / Omtrent Melancholie' at De Campagne Drongen Belgium 2004. Curated by Filip Van de Velde [SMAK, Museum of Contemporary Art Ghent Belgium]. Reprise Museu Nogueira da Silva Braga Portugal. [Letters to an Orchard] Melsele Belgium 1998. The same place but 6 months later. [Letter to an Orchard] urban silent ritual in an orchard that has to make way for a new residential area. Melsele Beveren Belgium 1998.